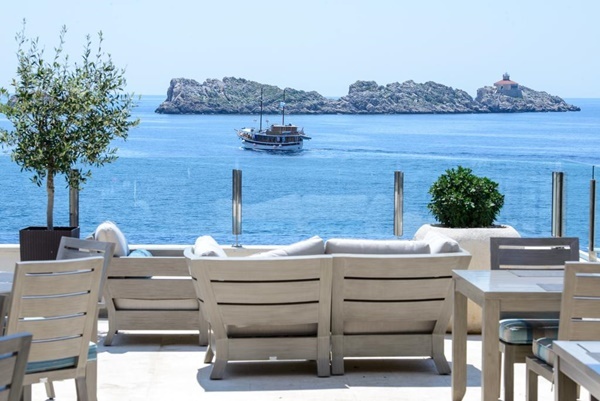 Hotel Ariston Dubrovnik is a part of the Importanne Resort together with Hotel Neptun, the Royal Princess Hotel, the Royal Palm Hotel and Villa Elita. 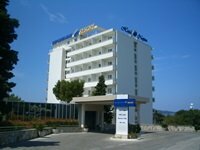 This hotel complex is located at the tip of Lapad peninsula, only 4 km from the Old Town. The hotel is surrounded by the crystal clear sea on one side and a rich Mediterranean forest to the other. 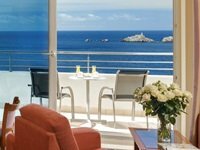 Hotel Ariston offers 115 modern and functional rooms of which 62 have a lovely sea view. Guests can choose from Standard, Luxury, Superior and Romantic rooms as well as rooms adapted for disabled persons. 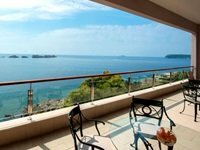 From hotel rooms you can enjoy amazing views over nearby Elaphite islands, popular day trip spot during summer. All rooms are equipped with LCD Satellite TV, phone, minibar, safe, hairdryer, air-conditioning, work desk and spacious closet. Complementary Wi-Fi is available in the rooms. Guests of the hotel have a choice of three restaurants and a beach bar. Mediterraneo Restaurant features a wide buffet with local, national and international dishes. At this restaurant guests can have breakfast, lunch and dinner. The Zoe Restaurant offers a great selection of fish, scampi or shelfish prepared in the Mediterranean way, as well as continental dishes. This place has a beautiful terrace with amazing sea views. La Castile Restaurant is a newly-opened restaurant where you can enjoy in Mediterranean and fusion cuisine. A location on an outdoor terrace and great atmosphere will make your visit to this restaurant enjoyable. On the Rocks Coctail Bar & lounge boasts a spacious terrace and seafront location. This bar serves all kinds of hot and cold beverages, coctails and light meals. Hotel Ariston Dubrovnik has a private beach which for the last few years has been awarded the "Blue Flag" for cleanliness and quality. The beach consists of rocky and concrete area with several ladder points to climb into the sea. Hotel's guests also have full access to two pools for adults and children's pool. Deck chairs and parasols are available on the beach for the use of guests. If you prefer pebble beaches, there is a one (Hotel's Valamar President beach) in the near proximity of the hotel and it's open for public use. Guests staying at Importanne Resort can relax yourself at wellness and spa (550 m2). It offers a wide range of massages, Finnish sauna, steam bath and indoor pool. There is also a fitness studio equipped with the latest exercise equipment. At the Information desk of the hotel guests can book a range of sightseeing tours and excursions (Dubrovnik's Old Town, Elaphite islands, Peljesac, Montenegro, Bosnia & Herzegovina). If arriving by car there is a a covered parking space is available for the use of hotel's guests. Importanne Resort is an excellent choice for conferences, congresses or other business gathering in a unique setting, featuring the latest equipment. It offers a choice of 12 conference halls (15 to 500 participants) as well as separate areas for socialising during breaks. FROM DUBROVNIK AIRPORT: The the airport shuttle bus will take you to Pile Gate (western entrance to the Old Town). From there take either bus No.5 or No.6 to the last stop. Hotel Ariston is located just few minutes walk from the bus stop. FROM DUBROVNIK PORT/MAIN BUS STATION: Take city bus No.7 from Gruz and travel until your reach the last stop. Hotel is very close to this bus stop. FROM OLD TOWN: From Pile Gate take bus either bus No.5 or No.6 and travel to the last stop. Hotel is just few minutes walk from there.